When I woke up on V-Day morning, the sweet hubby had left me a love note on the bathroom counter. What a great way to start my day. Around 11 I recieved a beautiful bouquet of flowers at school, with some of my faves....lilies and orchids! I LOVE getting flowers at school!! When I got home from work, Big Jon had a surprise gift for me. He bought me the past two seasons of our new favorite show (which I will NOT admit on the internet cuz I'm totally embarassed that I watch it!) and new headphones (praise the Lord....my old ones are so ghetto!). His mom & dad sent me some yummy chocolate covered strawberries from the Fudge Factory.....ya just can't beat it! My favorite of all though was the sweet card. It was so thoughtful and perfect. He's such a sweet man and I am so blessed to have him. (I got him new tennis shoes and a card, btw!) Am I spoiled or what? After exchanging gifts and a few kisses after work, we headed to the gym for a mini-workout. We didn't have much time before our reservations at the Melting Pot, so we just did a short, intense shoulder workout. Typically we do our own thing in the gym because I do more cardio & full body stuff while Big Jon lifts heavy, so but we worked out together yesterday & it was really fun. 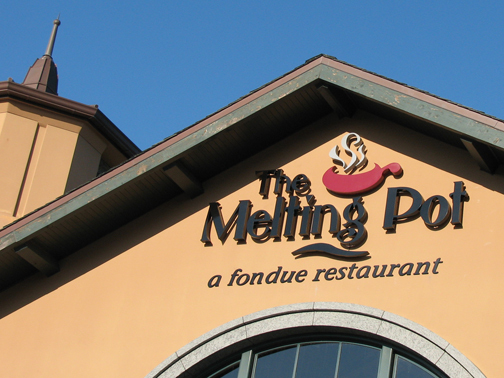 And then headed to MP for some delicious fondue! and made it home right at our midnight curfew! ha! I'm paying today though. I'm sleepy and smell like my dinner....yuck. anyways! i'm TOTALLY jealous of melting pot! we ate there the night before zach proposed and haven't been back since!!! So glad you figured out the font thing. I was going to write you a long tutorial but I probably wouldn't have been much help. You can also dl free fonts from the world wide web and use them, however, my computer is too ancient to handle all that, hah.